Tasmanian cities and towns do not have networks of separated cycleways. Too much of our bicycle infrastructure is lines painted on the road when we need paths separated from vehicle traffic. Separated cycleways connected to schools, workplaces, tourism attractions, shops and other areas of interest have been shown to contribute to big increases in rider numbers. 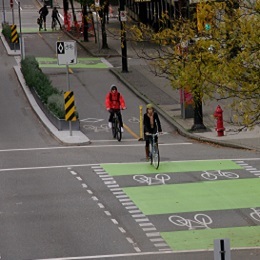 Cities that are building separated cycleways include Sydney, Vancouver, Melbourne, Portland, Washington, London and Seville. This is because the majority of the population are interested in riding but are concerned about safety. Well-designed cycleways that separate riders from vehicle traffic and provide clear intersection treatments encourage people to ride who wouldn’t if there were just painted lanes. When more people ride, it becomes safer for all riders. Research has shown that when bicycle riding becomes more common drivers are more likely to look for bicycles and the number of crashes declines. We want Tasmania to shift from painted bicycle lanes to separated cycleways and low-speed local streets. Local and state government commitments to separated cycleways will get more people riding which is good for health and transport congestion. Tasmania’s cities should develop bicycle plans with networks of separated cycleways at their core. To help pay for the networks, the state government should establish a standing bicycle infrastructure fund for state and local roads that prioritises separated cycleways. Some two-thirds of Tasmanian adults and children don’t get the recommended exercise they need to prevent diseases such as diabetes, heart disease and some cancers. Building bicycle infrastructure that people of all ages and abilities can use for their daily transport will help the state government to meet its goal of Tasmania being the healthiest state by 2025. Separated cycleways will get more people riding and has the potential to reduce traffic congestion and provide Tasmanians with a cheap, clean form of transport. Bicycle Network has called for separated cycleways to be part of the Hobart City Deal. 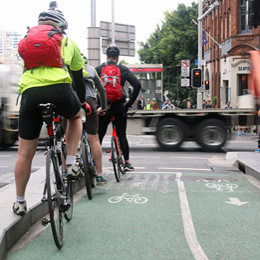 Bicycle Network has called on the City of Hobart to commit to separated cycleways as part of its 2018 Transport Strategy. 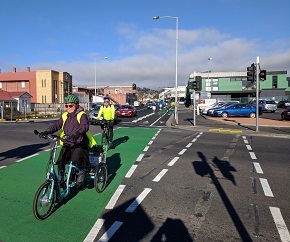 In July 2018 Bicycle Network held a forum for local and state government about introducing separated cycleways in Tasmania. But the negotiations have been held behind closed doors and we haven’t had the opportunity to let the Premier know what we think should be prioritised. Cities around the world are retrofitting their roads to include separated cycleways for transport but our capital city is lagging behind. To make it easy for you, you don’t have to mail your letter to us (although of course you’re welcome to if it’s easier for you). You can email it to us at campaigns@bicyclenetwork.com.au and we’ll deliver it to Premier Hodgman. Just make sure you put your name and address on it and address it to the Premier. So please, before it ticks over to 2019 take a few minutes and send us your letter. It doesn’t matter if it’s 4 lines or 4 pages, we just need to all to make sure that the next 4 years are the time we get moving on bikes. It would also be fantastic if you could spread the word and ask your friends and family to write a letter as well. The more of the quiet minority of bike riders who speak up, the harder it will be for Premier Hodgman to ignore current and potential bike riders. Thanks so much and have a great Christmas. PS You might be thinking, ‘Can’t you just send me a template I can stick my name on?’ We’d rather not as it just won’t have the same impact. If the government gets a lot of letters the same it will easily whip up a template response, create a list and spew out the response on mass. Individual letters have a greater impact because they require an individual response. Many thanks. PPS Address your letter to: The Hon Will Hodgman, Premier, 11th Floor, Executive Building, 15 Murray Street, Hobart TAS 7000, will.hodgman@parliament.tas.gov.au. 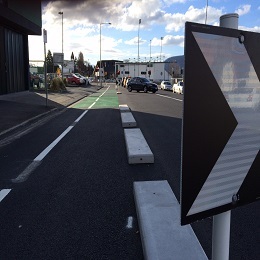 Here’s a few easy ways you can help get separated cycleways built across Tasmania. Contact the Tasmanian Premier, Will Hodgman, to let him know you support separated cycleways as part of the Hobart City Deal.